Are you an emerging writer? 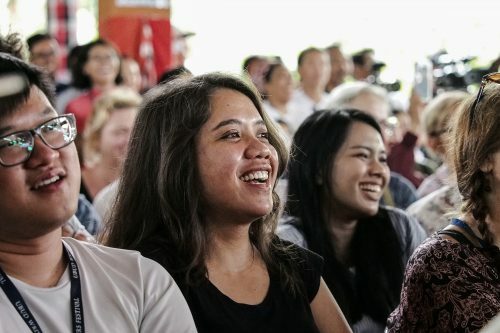 Would you like to travel to Ubud Writers & Readers Festival 2019, and have the opportunity to have work published in Meniscus journal? In partnership with the Australasian Association of Writing Programs (AAWP), we are proud to announce the return of the AAWP X UWRF Emerging Writers’ Prize. Enter your short story or poem based on this year’s UWRF theme, Karma, to be in the running. While previously open only to those based in Australasia, the Prize is now open to emerging writers anywhere in the world. The winner will receive a 4-Day Main Program Pass to UWRF19 (23-27 October), accommodation for the duration of the Festival, and AUD500 towards airfares. In addition, they’ll receive a one-year AAWP membership and fully subsidized conference fees to attend its annual conference, where they’ll be invited to read from their winning work. In addition, the editors at Meniscus will consider the work for publication. Sound good? Read the details below then get writing! This competition is open to emerging writers anywhere in the world. Emerging writers will not have a full-length, single-authored, commercially published print publication in any genre. Emerging writers who have published in electronic format only, or who have published work in collections showcasing multiple authors, are eligible. The Prize opens on 22 March 2019 and closes at midnight AEST on 31 July 2019. Late submissions will not be accepted. The winner will be announced on the UWRF website and the AAWP website no later than 15 September 2019. Entries must be in English and not exceed 30 lines (poetry) or 3000 words (prose). Entries should respond to the UWRF theme. The 2019 theme is Karma. Click here for more information about the theme. The judges’ verdict is final. No correspondence or discussion will be entered into. Click here for Prize Guidelines. Please go to the AAWP website aawp.org.au for further information, available under News (Opportunities) or Journals (Meniscus). The entry fee is AUD20.